And, it was no other than System 3 which has come close on previous occasions, who got it right this time around. Avenues, however, was the one to get on the score sheet first in the first minute, when Myron Samuel made good of a miscommunication and hesitancy by the System 3 defence, to slot home the ball from within the penalty area. Parity was restored on the stroke of half time, when Azhino Solomon successfully converted from the penalty spot, after Avenuesâ goalkeeper Dwaine Sandy had impeded Vasbert Ledger, who had rounded him. Early in the second stanza of the match, the more youthful and purposeful System 3 piled the pressure on a disjointed Avenuesâ back four. The burst came in the 51st minute, when Kyle Edwards latched on to a right foot shot to beat Sandy and put System 3 in the lead. 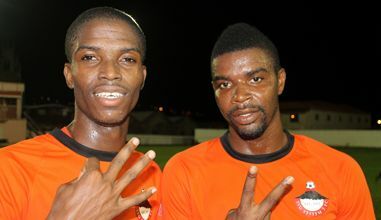 System 3 extended the lead in the 57th minute to 3-1, as veteran striker Shandell Samuel pounced on a loose ball. Avenues reduced the deficit in the 68th minute by way of a penalty by Myron Samuel. This seemed to have added an injection of greater life to the match, with both outfits going for broke. Despite being in the ascendancy, it was System 3 which looked vulnerable, sparked by some changes in personnel. This was exploited by Myron Samuel, who cut through System 3âs defence with consummate ease, but was stymied by goalkeeper Kenyon Lynch, who was asked to make decisive saves. At the other end, System 3 could not take advantage of Avenues having defender Shorn Lowman ejected for a second bookable offence. System 3, however, held on to claim the elusive victory over Avenues since 2010. Avenuesâ unbeaten run, which spanned over 80 matches, saw them claiming three successive titles in 2010, 2011 and 2012, and second in 2013. Before last Sundayâs excitement, the championships actually got going on Saturday.